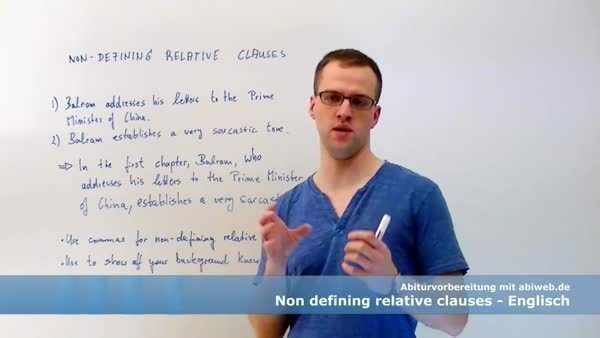 In diesem Abschnitt geht es um "non-defining relative clauses", die Auswahl von Relativpronomen und die Verwendung von Präpositionen in Relativsätzen. In the first chapter, Balram, who addresses his letters to the Prime Minister of China, establishes a very sarcastic tone. Balram addresses his letters to the Prime Minister of China. Balram establishes a very sarcastic tone. You then join the two sentences, one of which becomes a sub-clause (i.e. the relative clause), together. Use commas for non-defining relative clauses!! Vijay, who is the hero of Balram's childhood, manages to escape the grinding poverty of the village. Ms Uma, whom Mr Ashok starts dating after his relationship with Pinky Madam, turns out to be his earlier girlfriend. The phrase "my father was permanently cured" is a text-book example of the narrator's cynicism. This is due to the word "cured", which has a double meaning here. On pages 28-29 Balram gives a vivid and ironic description of his village, which lacks electricirty and running water. Is Balram, who kills Ashok, stricken with remorse? By employing a few relative clauses here and there, you can easily demonstrate your background knowledge, and at the same time the text can run on smoothly. Generally speaking, the choice of relative pronouns follows the same rules as for defining relative clauses, but you do not use the relative pronoun that for non-defining relative clauses. As the novel unfolds, the narrator also talks about the role of police officers, most of whom appear to be corrupt. Blaram, whose village is controlled by unscrupulous landlords, finally manages to escape the rooster coop, which is also used as a central metaphor in the novel. Balram compares himself to the Prime Ministers of China, both of whom he sees as great men. In spite of his poor education, Balram thinks himself to be the future, which can even be interpreted as hybris. Balram represents a great number of arguments, two of which I am going to have a closer look at. From the start, Balram says that he committed a crime, the details of which we learn much later in the novel. In sentence 3, I use the pronoun whom instead of who because it sounds better when the pronoun is the object in a non-defining relative clause. As you can see, in sentence 4 the relative pronoun does not have a single word as reference. It rather refers to the sentence as a whole. This is called a sentential relative clause. It can be used to comment on the sentence as a whole; it is ideal to include your own opinion, where needed. I hope I've aptly demonstrated the use of non-defining relative clauses. They are comparatively easy to produce and if you include prepositions and adverbial phrases like in the examples above, they even sound sophisticated, too. through which, by which, whereby, in which, of which, neither of whom, both of which, both of whom, the details of which, the cause of which, the best-known of which, some of which, much of which, many of which, an important part of which, all of which, a few of which, the story of which, a large part of which, the freedom of whom, the freedom of which, each of which, the scope of which, the vast majority of which / whom, one of which/whom, a copy of which, the whole of which, etc. Tip: Always use whom after prepositions in formal style! 1. Balram addresses his letters to the Prime Minister of China. 2. Balram establishes a very sarcastic tone. Diese beiden Sätze werden dann zusammengefügt und Nummer 1 wird dabei zum Relativsatz. Trenne non-defining relative clauses mit Kommata ab!! On pages 28-29 Balram gives a vivid and ironic description of his village, which lacks electricity and running water. Wenn du hier und da einen non-defining relative clause einstreust, kannst du Zusatzinformationen geben, ohne durch sie den Textfluss zu unterbrechen, weil sie elegant in einen Hauptsatz integriert werden. Grundsätzlich gilt hier das Gleiche, wie schon bei den defining relative clauses. Jedoch darfst du einen non-defining relative clause nicht mit that einleiten. 1. As the novel unfolds, the narrator also talks about the role of police officers, most of whom appear to be corrupt. 2. Blaram, whose village is controlled by unscrupulous landlords, finally manages to escape the rooster coop, which is also used as a central metaphor in the novel. 3. Balram compares himself to the Prime Minister of China, both of whom he sees as great men. 4. In spite of his poor education, Balram thinks himself to be the future, which can even be interpreted as hybris. 5. Balram represents a great number of arguments, two of which I am going to have a closer look at. 6. From the start, Balram says that he committed a crime, the details of which we learn much later in the novel. Grundsätzlich gilt, dass du who als Subjekt verwenden musst und whom als Objekt bzw. nach Präpositionen (Satz 3). Alltagssprachlich wird aber whom als zu formell empfunden und durch who ersetzt. Wenn vor dem pronoun aber ein quantifier wie z.B. all of, both of, few of, many of, several of steht, wird jedoch immer whom verwendet. In Satz 4 bezieht sich das Relativpronomen nicht auf ein einzelnes Wort, sondern auf einen ganzen Satz. Man nennt solche Fälle sentential relative clause und mit ihnen kannst du größere Zusammenhänge kommentieren und deine Meinung ausdrücken. 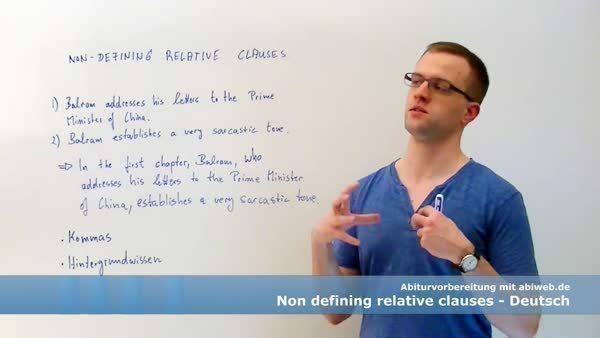 Die Verwendung von non-defining relative clauses dürfte nun kein Problem mehr für dich darstellen. Sie sind eher einfach in der Bildung, aber können in Verbindung mit prepositions und adverbial phrases deinen Schreibstil deutlich verbessern, wie die Beispiele oben zeigen. Benutze in formellen Zusammenhängen, wie z. B. Klausuren, immer whom nach einer Präposition! Wähle das richtige relative pronoun aus. 1. Balram represents a great number of arguments, two of which who that I am going to have a closer look at. 2. Blaram, whose whowhom village is controlled by unscrupulous landlords, finally manages to escape the rooster coop, which that is also used as a central metaphor in the novel. 3. Tom's brother, who that lives in Scotland, has 4 children. Dieses Dokument Non-Defining Relative Clauses Erklärung und Übungen ist Teil eines interaktiven Online-Kurses zum Thema Englisch Grammatik Crashkurs. Daniel Stodian verfügt über langjährige Erfahrung auf diesem Themengebiet. Vielleicht ist für Sie auch das Thema	partielle Integration	(Integralrechnung)	aus unserem Online-Kurs	Weiterführende Aufgaben der Analysis (Analysis 2) interessant. Vielleicht ist für Sie auch das Thema	Nernst-Gleichung	(Donator-Akzeptor-Prinzip)	aus unserem Online-Kurs	Anorganische Chemie interessant. Willkommen im Grammatik Crashkurs für dein Englisch Abitur! Einleitung zu Willkommen im Grammatik Crashkurs für dein Englisch Abitur! Wie werden Adjektive und Adverbien im Englischen gebildet und gesteigert?